The last time I spent time around the backwaters of the Mississippi River, in a Southern Fried cultural slice of life picture, I suffered through the headache inducing "Beasts of the Southern Wild". So it was with some trepidation that I approached this movie. Much of it seems centered around a backwoods river culture that is not really that appealing as a setting to me. I respect traditions and the hard work that it can take for a person to make it under those conditions, but it also seems to breed, at least in movies, a suspicion of outsiders and a tendency to be insulated. Fortunately, this film while having many of the characteristics I was worried about, also has some very sympathetic characters and the traditions seem to be respected for the values they impart, not just for the differences they evoke. This is a coming of age story that centers around the relationship of two fairly normal, rural river kids and a mysterious stranger. The man enters their lives, seeps into their consciousness, and drives their ultimate development, and maybe not always in the right ways. Matthew McConaughey plays the dangerous refugee named Mud. The character turns out to be just as familiar with the ways and people of the small town and surrounding areas as the two boys are. It turns out that while he is a stranger to them, he is not a stranger to their world. 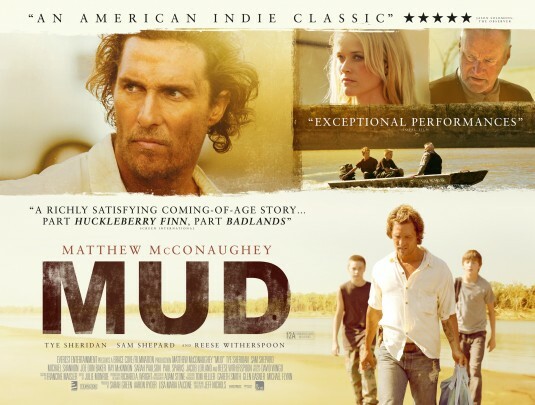 McConaughey gives a fantastic performance. His body language suggests confidence and superiority. At one point another character points out to the boys that they probably see him as a badass. While most of his physical demeanor might suggest that, his voice sometimes gives way to a sadness that allows us to see through the cracks. He is not always as certain of himself as he seems to suggest. His honey coated voice and corn pone manner of speaking are a disguise. One that is meant to convey power but often comes across like a kid embellishing the truth to make himself look a little better. McConaughey has always been trapped by his accent in his other roles. That may have masked the fact that his is a very competent actor. Here the accent fits the location and the character to a tee, and we get to focus on his performing gifts in an appropriate context. He runs with this part and makes Mud a compelling character that is maybe dangerously psychotic or achingly unfulfilled and yearning. Right now there are two names I am thinking about for Awards Season next winter, along with Harrison Ford in 42, McConaughey's name will probably be whispered by some and shouted by others. The two kids are played by young men who are both perfectly cast and, at least at this point, show promise of a whole bunch of talent. Tye Sheridan has some acting experience, at least if you would call appearing in "The Tree of Life" acting. I don't remember enough about him from that film, I do know he was not the main actor playing Sean Penn as a kid. In this movie he has a perfect mixture of guts, naivete, and sweetness to make him believable. The scenes where he woes an older girl with some success and failure are very honest and easy to identify with. His motivations are pure, even if his actions are not always well thought out. When his character Ellis, interacts with his parents it is with the awkward love that a young teen would have, complicated by the uncertainty that his family situation presents. We can understand completely why he would believe the things Mud tells him, and dream of making life's wishes come true. His buddy Neckbone, is played by newcomer Jacob Lofland, and he is just a natural in the role. There may not be much technique in his acting because he basically plays a smart kid in a tough situation, who is making the best of it that he can. He plays the best friend like a real friend would act, and maybe that is the secret to casting child actors. Find a kid who really is the character they are playing. Everyone else in the movie gets some moments to shine as well. Michael Shannon has some great comic moments but also infuses the situation with a serious tone when he speaks to Ellis as the protective Uncle of his best friend. There may not be much subtlety to the metaphor that he presents to Ellis, but it sounds sincere and properly concerned. Ellis' parents are both solid characters, living out an unpleasant reality while trying to keep their son on the straight and narrow path. Although they seem to approach the process in completely different directions, they are each trying to achieve the same goal. There are three other characters that figure prominently in the story. Sam Shepard gets a chance to shine as a neighbor who may know more about the events going on than anyone else. He looks much older in this part but his distinctive, flat voice carries the same authority it did in "The Right Stuff" thirty years ago. Joe Don Baker has made a living out of playing menacing big guys for nearly forty years. From good guys like the sheriff Buford Pusser in the original "Walking Tall" to the mob hit man tracking down "Charlie Varrick", he has always been effective. When he shows up, you know that trouble has come to town. He doesn't have much screen time but he makes the most of it. Also without a lot of screen time but showing herself to be the quality actress she is supposed to be is Reese Witherspoon. She is the trigger point for much of what happens on the screen, and she conveys the dangerously indifferent lover as world-weary and soft hearted at the same time. The echo of her behavior in Ellis' life is again a little obvious, but it needs to be for him to learn from the events that unfold. The less said about the story the better. Not because it is bad but because it works so well and it will be more enjoyable if you experience it as it is revealed. There are some surprises but mostly we get an honest outcome of the dangerous relationship these boys have with the title character. Sure there are a couple of lucky coincidences, that is true in all stories. We see people living lives that seem so obviously wrong headed at times, but they just are these people's lives and so it is normal for folks to miss the big picture at times. There is a morality in all of the lead characters that seems to come into conflict, so that it is not easy to say who is acting in the best way. We can clearly see however, that we want things to work out a certain way. That some of them do and some of them don't is life. I am willing to say that at this moment, this is the best picture I have seen that has been released this year. It isn't going to break the Memorial Day Box Office Record, it won't win a dozen awards at the end of the year, but it will satisfy you as you watch it. You will thank me if you take my advise and go see this movie. If you were going to see it anyway, you may not thank me, but I bet you will agree with me. Thanks Chris, appreciate the visit and the comment.